So as of this blog entry, I now have 756 total entries that go all the way back to 2009. I started to blog for my last TV station in Dayton. 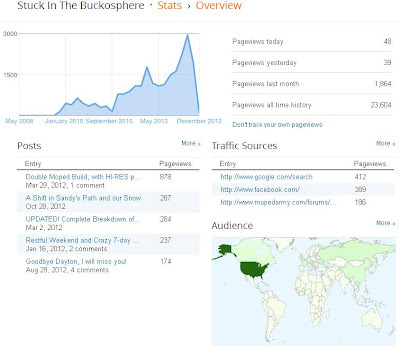 I started the "Buckosphere" alongside so that way when I left I would be able to keep a constant blog flowing and not lose all that information that I ended up blogging, venting, sharing, and enjoying with all of my readers. It is often fun to go back and see what I was doing a couple years ago on this date. The blog has came a long way. So as of today I have had over 23,000 visits. 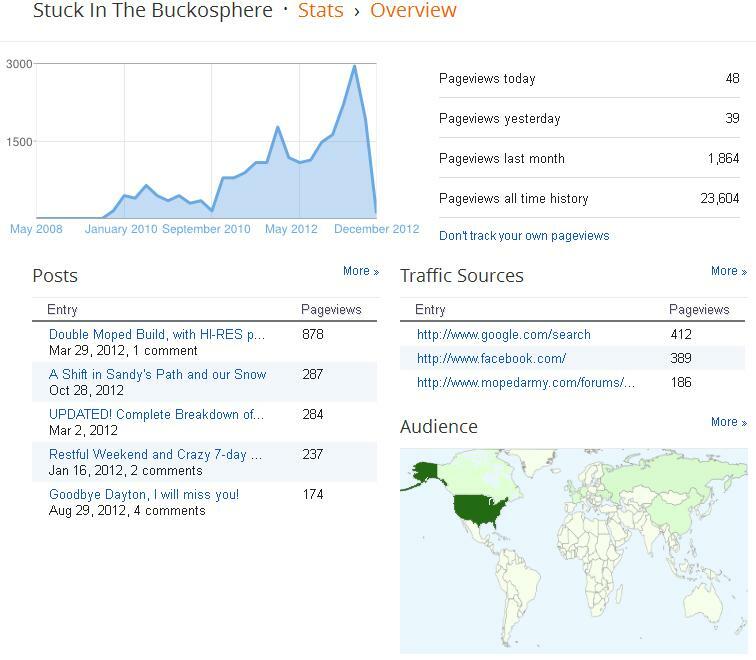 The number was low for a while, but when my station took down the blog on their website then a lot of people in Western Ohio started to read the Buckosphere to catch up on the shenanigans, forecast, and moped chatter that go along with my life and where I live, Ohio. Goodbye Dayton, I will miss you! I am not completely surprised by the top viewed entry because I spent a LOT of time rebuilding both of my mopeds and it was great to put all the work into one clean blog entry. I will admit that there was a LOT of little details that I left out, especially about the disc brake conversion, but if I included ALL of that then that one entry would be like a novel. And I also included some of those smaller details in normal entries along the way. I owe a lot of the traffic to Google. 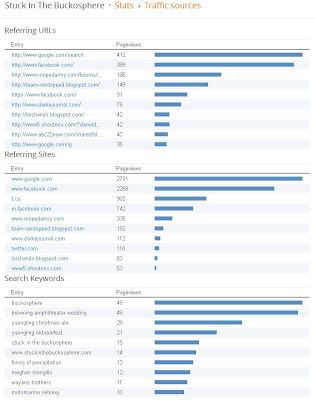 About 10% of my blog visits are based from Google. That is followed closely by Facebook and other social media outlets... including Moped Army, special shout out to Moped Army and all the knowledge and trolling that it has brought the last few years. I also want to shout out to the Darke Journal. 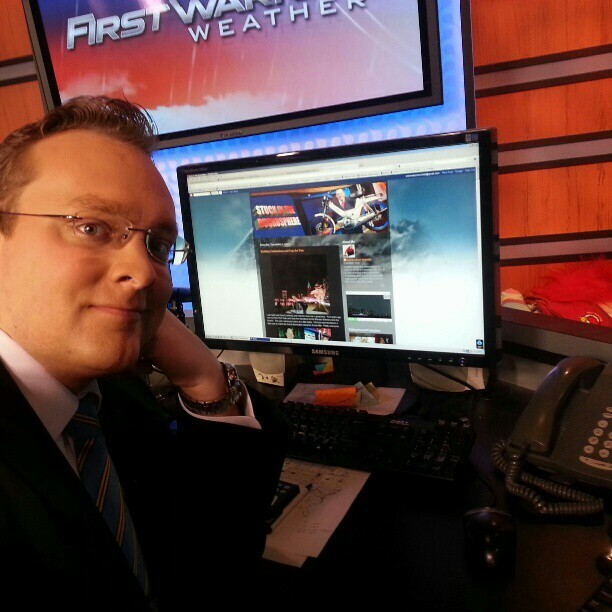 The online journal has really taken off the last few years and a great way to catch-up on my hometown happenings. So there you have it... 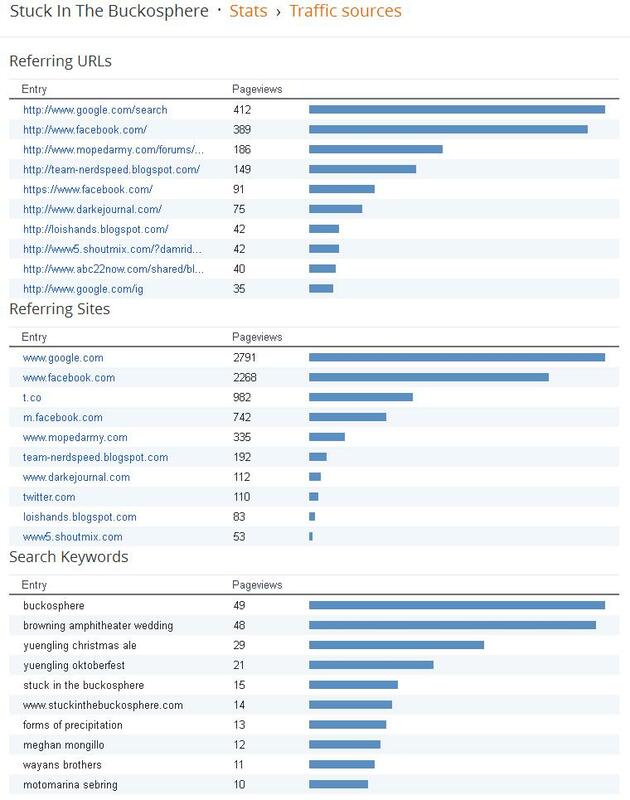 Some of the information I find pretty funny that my blog would be the search keyword. Hope that useful(less) knowledge can help you win Who Wants To Be A Millionaire someday... If it comes back. Side note to the behind the scenes information. I saw this online today and thought it was pretty cool. 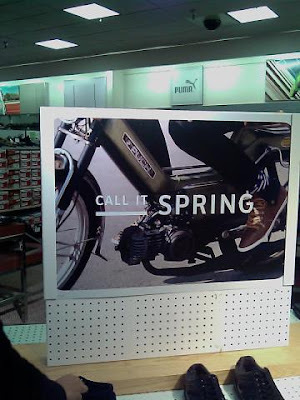 Apparently JCPenney has an ad or two with a moped in it. I that it was pretty sweet. Early shower possible Monday, but other than an early shower we will stay dry with a little clearing in the afternoon and very warm for the start of December. Temperatures will be running about twenty degrees above normal. More rain for Tuesday as a cold front pushes through dropping our temperatures for the middle of the week. We dry out for a couple of days then more wet weather as we approach next weekend. P.S. I would LOVE to know how you find your way to my blog when you visit? Is it a link? Do you have it bookmarked? Let me know, thanks! Tonight's snow and more next week. Let it snow! Blizzard 2012 is here! Blustery today... Big snow on the way?! UPDATE! Snow Forecast: Foreign Wins! Winter moped projects, more snow, & WIND! A Frosty Top O' The Mornin' To Ya!